주요성분 : 마이타케 D-fraction & Saw Palmetto etc..
* 건강보조식품 이며 치료약 이 아닙니다. 엄선된 원료들 로 조제된 품질이 아주 우수한 제품 입니다. 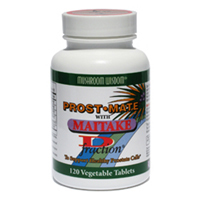 Prost-Mate® is a super formula to support a healthy prostate function with selected ingredients for that specific purpose. Saw Palmetto, Lycopene and Pumpkin Seed are well known for their health benefit to maintain healthy prostate*. Green Tea is a potent anti-oxidant*, and an extract of Maitake D-fraction® (PD-Fraction) maintains healthy immune system*. As a dietary supplement, take 2 caplets twice a day or as directed by your practitioner.